This blog by Royce Holladay was first posted May 7,2015 at http://www.adaptiveaction.org/blog/201505/Telling-Your-Story. It’s a perfect companion to our 2015-16 webinar series. You have an important story to tell. Whatever it is, your story is unique to you, and it is your opportunity to share who you are, what you do, and the place you stand in the world. You depend on your story to draw clients and customers to your business; to engage people in your interests; and to call them to action. Effective stories create compelling, sharply defined pictures to share. The reason it is so difficult to tell a focused, compelling story is that you are creating a narrative about a very complex situation. Because you live, work, and play in complex systems, your story is about multiple forces that influence and shape the patterns around you. It is populated with a variety of individuals, ideas, information, and interactions. The events, concepts, and relationships in your world are connected to each other in nonlinear ways that make it difficult, if not impossible, to map a straight path between cause and effect. These characteristics can shape a story that is ultimately messy and undefined. What can you do to clarify and focus your story? HSD offers tips to create and share your story as a compelling and powerful narrative of who you are, what you want, and what you created. Point to the tension in the system. Good narrative focuses directly on the tension in whatever system you are describing—interpersonal interactions, organizational concerns, community activities. What is the conflict? What needs to change? Where is tension building, and how might it be released creatively? Those kinds of questions can help build a compelling narrative. They help you describe how individuals and groups respond when tensions they experience are not uncomfortable, or “fit to purpose” for their system. Describe the patterns. A narrative can seem mundane when the storyteller tries to include all the facts and drama of the story. Sometimes details that have personal meaning to the story teller, but are just confusing—even boring—to the audience. Avoid this by framing your narrative around the patterns in your system, rather than around details. Examine your story for similarities, differences, and connections that hold or shape the greatest tensions in the system. For instance team members come together to accomplish a task and their work together shapes patterns. Team members bring similar understandings of the task and commitment to completing it. At the same time, they bring different skills to that task. Ultimately if these diverse individuals connect with each other in supportive and complementary ways, they will generate patterns of collaboration and coordination. If, on the other hand, they connect in uncooperative or independent ways, they may generate patterns of competition or “star” worship. Look at your story and pick out one or two powerful patterns to focus the listener on what’s most important. Make your narrative brief and to the point. In today’s world, most people just don’t have time for long, drawn-out stories. You have to paint your picture in a handful of sentences. After you identify two or three patterns you want to highlight, begin to describe them. For each pattern, describe what holds or bounds the pattern (the place, issue, time, people, etc.). Then talk about the differences within the pattern that are important (values, interests, skills, contributions, etc.). Finally, describe how parts of the pattern connect (intimacies, dependencies, language, feedback, data, etc.). Engage the audience to explore individual and group interactions around system tensions. Include both actual and aspirational narrative. Actual narrative describes patterns that currently exist. Aspirational narrative describes the patterns you want to achieve. Both kinds of patterns are important to build a compelling story. The difference between the actual and the aspirational creates the tension for change. If you want people to get involved in your story, help them see the power of that tension. Express the arc of the story in your brief narrative. Present your story in a clear and disciplined arc that reflects the path of the change or event you are describing. 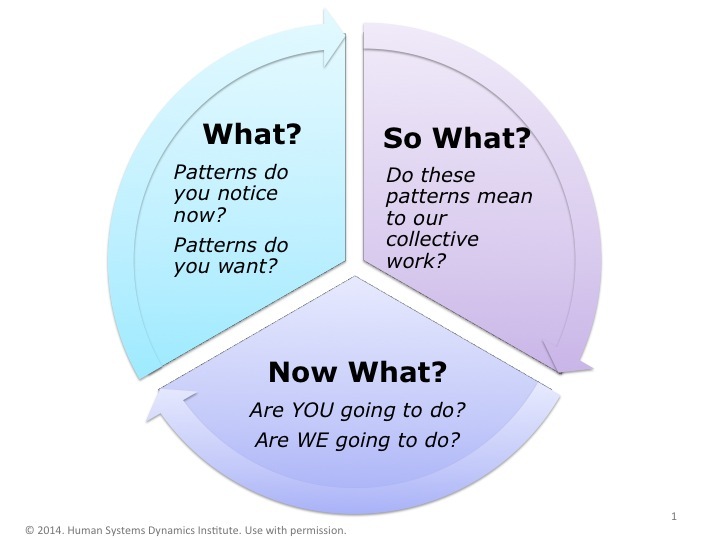 The iterative nature of the Adaptive Action cycle helps to shape that arc in your narrative. This cycle is made of three simple questions: What? So what? and Now what? Start with the What? Set the context of your narrative. Describe the patterns, both actual and aspirational, that are the focus of your story. Start with a few sentences to describe those patterns. Get it as lean and articulate as you can, then allow yourself to expand a bit, as the space and/or time allows. Move to the So what? Talk about dynamics, impact, and possibilities that emerge from those patterns. Explore what shapes those patterns, and what it tells you about the system itself. Identify what your deep understanding of those patterns tells you about the system’s tensions. List the options for action that emerged over time. Talk about how you assessed your capacity to take any of those actions, and the ways you considered their impact on the system as a whole before you chose one action to take. Move to the Now what? Choose one action and take steps to complete it. Explain what you did and the markers you looked for in the system to measure your impact. Talk about your timeline and your plan for involving others. Circle back to the What? Complete your narrative about by describing your final outcomes and talking about the next possible questions. Identify where will you watch for tensions in the system next time. Bring your narrative to a closure that looks to the future and moves your audience to action in support of the system’s aspirational goals. Focused narratives are useful in describing and explaining your system. They can communicate your expectations and hopes. They can help you amplify patterns you want and damp patterns you don’t want. Narratives can carry the messages you want shared inside your system and in the greater environment. Use these simple tips to create engaging and compelling narratives. Share with your colleagues and students, and watch what happens!